Heidi Staples has been immersed in all things vintage since she was a little girl. Whether she was tagging along with her grandmother to antique shops, watching classic movies with her parents, or listening to big band music on the radio, she quickly grew to love 1930’s-1950’s style. She also enjoyed dabbling in different arts and crafts over the years, including drawing, cross stitch, sewing, and ceramics. After ten years in teaching, she decided to stay home with her young daughters, and soon after she began quilting and sharing the details of her sewing misadventures at her blog Fabric Mutt. She quickly became known for colorful patchwork projects and the many free tutorials she wrote for the blog. 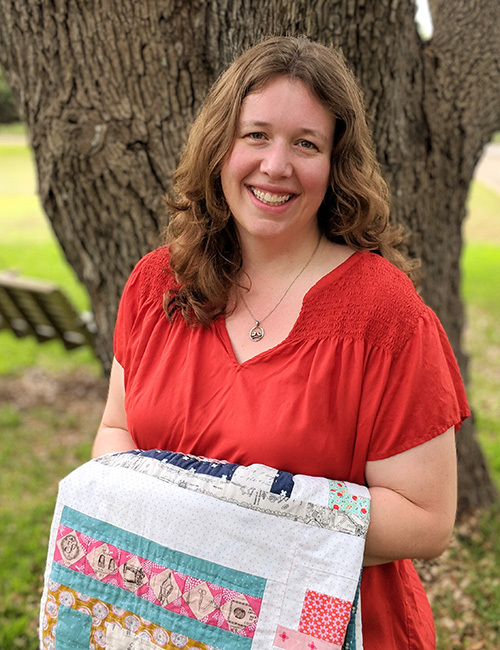 Heidi published her first book, Sew Organized for the Busy Girl, with C&T Publishing in 2015, and her work has also been featured in crafting magazines such as Modern Patchwork, Quilter’s Newsletter, Quilt Now, and Love Patchwork & Quilting. She is active on both Instagram and Pinterest under the name @fabricmutt. Heidi is thrilled to bring together her love of vintage style and sewing as she designs collections for Penny Rose Fabrics. She makes her home in a rambling house on two acres of beautiful Texas hill country, along with her husband, three daughters, two parents, and three lovable dogs.